BUGIRI: FDC’s Eunice Namatende and JEEMA’s Asuman Basalirwa were among the five candidates nominated on Wednesday afternoon to contest for the MP seat in the newly created Bugiri Municipality. NRM’s John Francis Oketcho and Independents Siraji Lyavala Samanya and Joel Wamono completed the list of candidates who will tussle out for the seat. Whereas all candidates were accompanied by supporters to the nomination venue, Basalirwa’s crowds caught the eyes of many as he was accompanied by artiste and Kyadondo East MP Robert Sentamu Kyagulanyi, aka Bobi Wine. All his supporters were also wearing red. Basalirwa was also accompanied by Abed Bwanika of the People’s Development Party. The surging crowds seeking to catch a glimpse of Bobi Wine disrupted activities at the nomination venue at the district headquarters, forcing the district Electoral Commission registrar, Ms Christine Kunihira, to first nominate Basalirwa. He was later handed a machete as a symbol power by his supporters. And while addressing his supporters, pledged to attract investors in the area and set up factories that will employ the youth and drive out unemployment from the area. 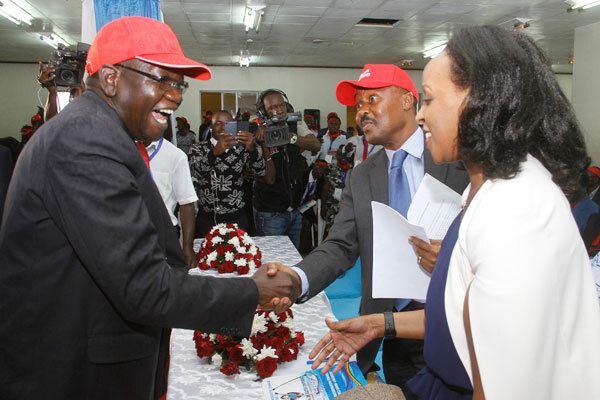 FDC and JEEMA failed to reach a consensus on fronting a single candidate for the seat. According to FDC party president Patrick Oboi Amuriat, Jeema officials did not turn up for several meetings aimed at reaching a consensus over the matter, with the latest being on May 17. “JEEMA decided to abscond from the meeting even when we waited for them for the whole day. We have now decided to name our flag-bearer and we are not apologising to any one for the decision taken,” Mr Amuriat said at the party headquarters in Najjanankumbi in Kampala last month. Ms Namatende pledged to win the seat even without the support of other Opposition parties. “I am not in war with anyone, I am here to campaign and take what the people of Bugiri will have chosen. I am aware of those who want to always manipulate the people but I would just like to assure my supporters that we shall work together to root out this vice. The people of Bugiri want someone who works for them and I have been there with and I am here for them,” she said. In 2016, Mr Basalirwa, a senior lawyer, vied for the Bukoli North parliamentary seat but lost. However, he had garnered the highest number of votes in Bugiri Municipality which has been carved off Bukoli North, which gives him a big chance. Inside sources in FDC believe that Mr Basalirwa also enjoys the support of some party members, especially those loyal to former president Mugisha Muntu. He also enjoys support among DP members. Bugiri Municipality, which was curved from Bukooli County has four Wards namely; Naluwerere, Nkusi, Ndifakulya and Bwole – with 27 Villages in total. The election is set for July 10.